Thanks to L.A.’s geography and topography, smog is nearly synonymous with our city’s name. Given that Los Angeles is located on a low lying coastal plain, surrounded by high mountains and deserts beyond, air circulation becomes limited by default. When we add the volumes of auto exhaust from millions of cars (the estimated population of Los Angeles County is 10,103,000), favorable atmospheric conditions, as well as plenty of sunshine to the mix, we have excellent conditions for smog production. Denver, Mexico City, and Santiago, Chile also have significant smog problems because of similar conditions. The image above was photographed on July 23, 2004 at 5:15 p.m. from the summit of Josephine Peak in the Angeles National Forest. Click for a larger version. 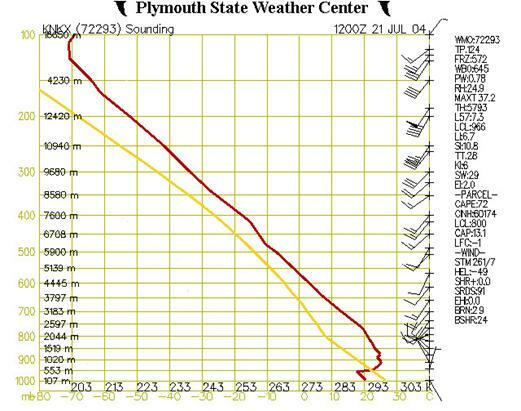 By interpreting a Stuve diagram, such as the illustration below, we are able to discern weather conditions for a given location, and understand how inversion layers aid in trapping smog here in the Los Angeles basin. Written by Anna Huber. Photograph by Anna Huber, 2004. Last updated, Aug. 26, 2004.